To stay ahead of competition, control cost, increase quality, reduce time–to–market and offer innovative solutions, your company can consider outsourcing. You can get access to all of the above benefits by outsourcing to India. Over the years, India has made a name for itself in the outsourcing market by providing quality solutions at a low cost. Today, India is one of the ten fastest growing economies in the world. In a recent survey conducted in the US, 82% of US–based companies have voted for India as their first and most preferred choice for software outsourcing. Though other outsourcing destinations like China or the Philippines also offer low cost services and fast turnaround time, it is only talent–rich India that provides unmatched quality and has the largest number of skilled resources in almost every field. Gone are the days when only back–end work such as data entry and customer support was outsourced to India. India, with its state–of–the–art technology can now handle complex turnkey projects, such as the maintenance of legacy systems, business intelligence, system integration, business process re–engineering or e–commerce. You will not face any language or communication barriers as over 350 million people in India are fluent in the English language. 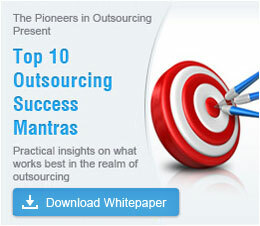 India has been successful in the outsourcing industry mainly because of the fluency with which Indians speak English. Why choose India over other outsourcing destinations? Contact us to start outsourcing to India today. Smaller outsourcing deals, increased demand for low-cost services & dying cloud computing. Read 9 IT outsourcing predictions.